Cottages in Instow have long been popular for their unrivalled views over the Taw Estuary and across the way to the quaint seaside town of Bideford and Appledore. Of the Holiday Cottages in North Devon, cottages in Instow prove to be extremely popular with families and those looking for quality, luxury self catering accommodation. Enjoy the blue flag golden sandy beach of Westward Ho!, quaint arty village shops, galleries, a stunning yacht club, great pubs and excellent seafood restaurants. 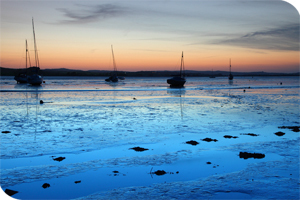 Cottages in Instow are an ideal spot for all types of water sports and fishing. You can even take the seasonal passenger ferry across to the historic fishing village of Appledore. The famous Tarka Trail is on the doorstep, perfect for walkers and cyclists following the estuary towards Braunton. Explore nearby attractions including Tapeley Park, The Big Sheep, Milky Way, National Trust Arlington Court, or board The Oldenburg for day trips to Lundy Island. To view all our Instow holiday cottages please see below, alternatively if you would prefer to search by date and criteria please use the search on the left hand side. Enjoy a relaxing stay in this pet-friendly seaside holiday home that is just a 15 minute walk from Instow beach.